When an expert on fairy tales is called in to consult on the investigation of bizarre murders, her premonition and insight causes suspicion; she must solve the case--and fast--to prove her innocence. Alice Hyland is an expert on fairy tales--lecturing on the well-known stories and their lesser-known variants--and the natural choice for Police Constable Cate Corbin to consult when a dead girl is found in the woods dressed up as Snow White. Especially when the girl's grieving mother receives a parcel containing a glass bottle of blood stoppered with the dead girl's toe. 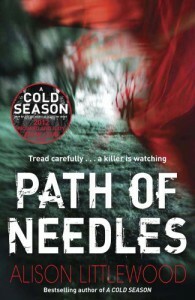 Cate's boss, Detective Superintendent Heath, isn't convinced of the connection to folklore until a second girl is found, this time dressed as Red Riding Hood and with claw marks gouged into her flesh, like a wolf had been at her. Easy read with an interesting concept and the variants on well know fairy stories were interesting. But I just didn't get along with this at all. It is difficult to mix the supernatural with crime/police procedural and this just didn't work for me. I found it hard to believe that two unconnected people living within the same area would have academic knowledge of the same subject. Also the ending was silly and perplexing, are we meant to believe that the murderer was rewarded with exactly what he wanted...?